Duke student of environmental studies will join peripatetic artist Torkwase Dyson in community-based project. 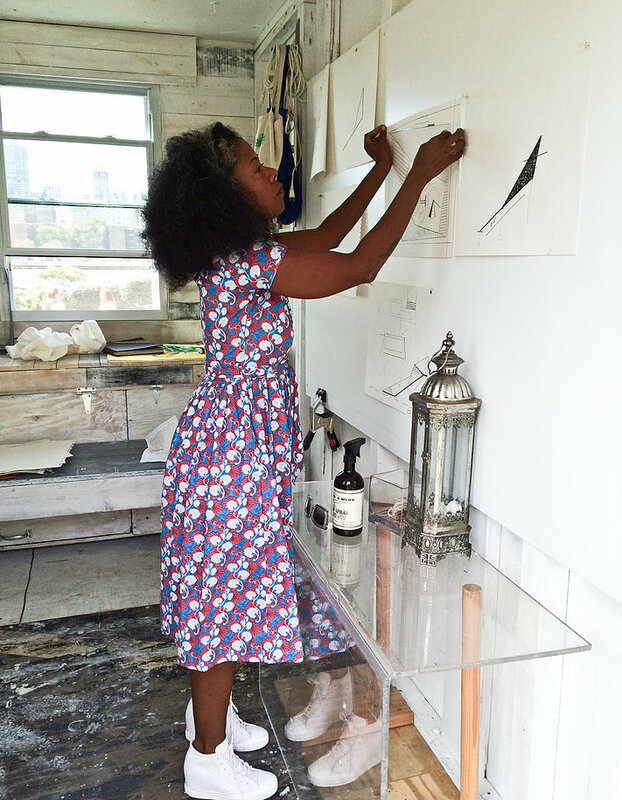 A Visiting Artist grant to the Nicholas School of the Environment will bring visual artist Torkwase Dyson to Duke University for an extended residency. Her project, In Conditions of Fresh Water, will begin with fieldwork during the summer of 2016 and culminate in February 2017 with a multimedia installation at the Center for Documentary Studies. The goal of the project is to produce a rich document of the intersection between black Southern geography and the struggle for environmental justice. Dyson will partner with Danielle Purifoy, a lawyer and Nicholas School Ph.D candidate studying racialized spaces and environmental inequality in the American South. Dyson and Purifoy will be joined by two community-based collaborators: Omega Wilson, a native of Alamance County, North Carolina and founder of the West End Revitalization Association, and Catherine Flowers, a native of Lowndes County, Alabama, and founder of the Alabama Center for Rural Enterprise. The project began in the summer of 2015 with a research initiative sponsored by the Franklin Humanities Institute that centered on the persistent wastewater sanitation challenges faced by majority African American communities in Lowndes County, part of the historic Black Belt region of Alabama. The sociopolitical conditions there—political disenfranchisement, generational black landownership and land loss, absentee white landownership, extractive industries, and strangled public financing—are replicated across the South, particularly in African American communities formed before the 20th century. As a participant in that project, Purifoy began exploring the historical origins of structural environmental racism, finding cumulative evidence that helped explain the contemporary environmental conditions observed not only in Alabama’s Black Belt but also closer to home, in Alamance County, North Carolina. The research experience dovetailed with ongoing conversations between Purifoy and Dyson and the two decided to collaborate. They believe that connecting the environmental and sociopolitical histories of Alamance and Lowndes Counties will engender an invaluable conversation about the immutable relationship between structural inequality and environmental destruction. In Conditions of Fresh Water will begin as a nomadic, collaborative, community-based, artifact-collection project. Dyson and Purifoy will spend two weeks in the unincorporated West End community of Alamance County and three weeks in similar communities in Lowndes County. They will travel between the two sites in Dyson’s mobile solar-powered studio space, Studio South Zero (SSZ). Purifoy will conduct interviews in order to assess black landownership, land preservation and loss, local economic development, the imposition of environmental burdens, and the provision of environmental services—particularly access to clean water and wastewater sanitation. The SSZ will allow community members not only to witness the creative process but also participate by creating maps, drawings, and photography. Material collected will be the basis for a visual and narrative comparative analysis of the two locales. The exhibition will be divided into three parts. One will be a wall of maps, photographs, documents, video narratives. Another will be a series of poetic sculptures inspired by the communities. The third will present a meta-narrative of the project itself. This project was supported by the Office of the Vice Provost for the Arts and Council for the Arts Visiting Artist Program of Duke University. The goal of the Visiting Artist Program is to support projects that will enrich the life of the university and broader community, augment the curricular efforts of a range of departments and programs, facilitate the interaction of artists and scholars, foster the reputation of Duke University as a place where the arts are vital and diverse, and contribute to the arts as a whole.